"There isn't enough space to say how helpful, kind and..."
Grand Cove resident in Grand Bend. Block foundation crawlspace needs your expertise as far as removal of standing water on top of poly. Needs new wrap underneath as musty smell goes throughout the house when air conditioner is turned on. No condensate pump that I am aware of. Would like to investigate your solutions for crawlspaces. I have a 1250 square foot crawl space with a dirt floor I would like encapsulated. It has 4-5 foot clearance and is split in 2 sections lengthwise by a support wall. A water meter is the only object in the space. Two cracks in foundation wall seem to be widening and lengthening over time. House built 2010. Photos available. Our house is about 17 years old and almost right from the time we moved in there was a crack in the basement floor about 20 feet long and about 1/4 inch wide. I have no problem with water leakage or anything like that but it is unsightly and I would like to get it repaired. We would like to winterize our cottage. I had the benefit of meeting Tom Blackburn yesterday at my home, Tom introduced himself and gave me some background information about the company he worked for. We not only adhere to the highest industry standards, we strive to be the industry leader in the home improvement related services we provide. We also use state-of-the-art products and technology which are designed to fix your home. 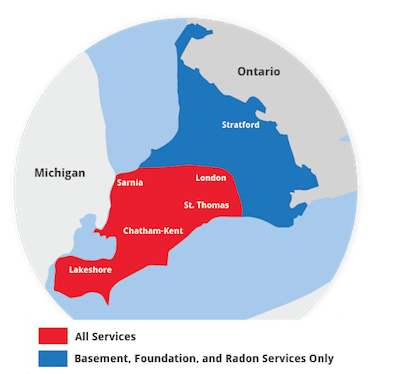 We are the authorized Basement Systems dealer in Grand Bend, ON. Our 2-lb closed-cell spray insulation is applied to the foundation walls to seal out any outside air leaks. Our installers are CUFCA Certified, so you can rest easy. Here you can see our Smart Jack support columns, our spray foam insulation and the Clean Space Encapsulation Barrier. It's now a bright, clean, usable space. Crawl spaces provide an excellent habitat for mould to grow! Mould not only smells terrible, but will eat away at the wood building supports of your home and cause lung damage to you over time.